While visiting Phillip Island in February, make sure you check out the San Remo Channel Challenge. This is a racing event that includes a 500 metre swim across the channel between San Remo and Phillip Island. Hundreds of participants head to this small township to compete in this race year after year. The race comprises of two stages, first complete a 500 metre swim across the channel. The second stage is a 2km run back over the bridge to reach the finish line in San Remo. 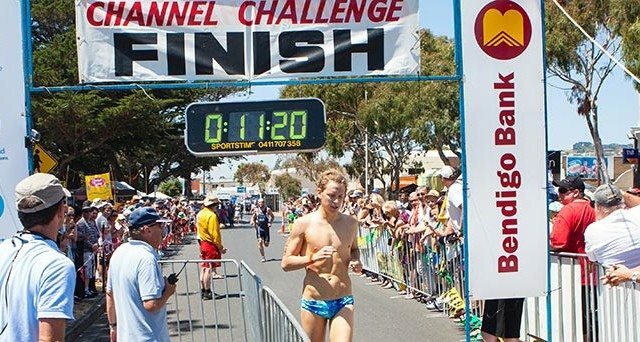 The San Remo Channel Challenge is the final of the three events in the Bass Summer Series which also includes the Phillip Island Penguin Swim Classic and the Cowes Classic. For those who are coming to the event as spectators, there is so much for you to enjoy. San Remo comes to life with children’s rides, market stands, food vendors, golf challenge, a fashion parade, live music and so much more! You don’t have to be a participant to enjoy this event, so come on down to San Remo and enjoy the summer atmosphere at this fun event. Road closures will occur as follows: The Phillip Island Bridge will be one way in each direction while the race is on between 12.30pm and 1.30pm. Marine Parade will be closed between Bergin Grove and Woolamai Grove from 9.00am until 5.00pm. Bergin Grove will be closed between Mary Grove and Marine Parade from 12.45pm until 1.30pm. The San Remo Channel Challenge is a major fundraiser for the Woolamai Beach SLSC and all proceeds go to supporting the volunteer patrols at Woolamai Beach and Smiths Beach in the summer months as well as the Jet Ski Rescue Service. Hi, do you have team events? We have 10 or so from the Wonthaggi police station showing interest to enter. I’m not aware of any team events, however you can contact the organisers to see if there will be any for 2018. You can contact them via their Facebook page here.